He is best known for his roles in Saving Mr Banks, Wolf Creek, Animal Kingdom, Sons of Anarchy, Neighbours, Pirate Islands and Home and Away. 6.00am - 7.00am: Yoga session at picutresque Alma Bay foreshore with Dani. (15 min break - walk to RSL Hall). 7.15am - 8.15am: Meditation session at RSL Hall with Grace. 8.30-12.30pm: Andy McPhee Coaching Session at RSL Hall (with 5 min breaks throughout). 12.30pm - 1.30pm: Lunch (At your own expense) Arcadia Village Hotel or BYO. 1.30pm - 6.00pm: Andy McPhee Coaching Session at RSL Hall (with 5 min breaks throughout). There are four dining options available at the Arcadia Village Hotel on Saturday night, visit arcadiavillagehotel.com.au for more information. Then check the Great Barrier Reef Film Festival program for film screenings. 6.00am - 8.00am: Andy McPhee Coaching Session at RSL Hall (with 5 min breaks throughout). 8.30am-12.30pm: Andy McPhee Coaching Session at RSL Hall (with 5 min breaks throughout). 1.30pm - 3.45pm: Andy McPhee Coaching Session at RSL Hall (with 5 min breaks throughout). (15 min break - walk to Alma Bay Foreshore). 4.00pm - 5.00pm: Yoga session at picturesque Alma Bay foreshore with Jasmine. 5.00pm - 6.00pm: Meditation session at picturesque Alma Bay foreshore with Grace. 6pm: Dinner (At your own expense) - There are two dining options available at the Arcadia Village Hotel on Sunday night. BOOK NOW - limited spaces available! Don’t miss this unique, powerful and transformational retreat! Hi, My name is Andy McPhee. What you will get out of this wonderful experience? You will get to know you. It’s not self-help or saying mantras out loud, it’s getting to know what can be blocking you from your greater potential, and creating more than you actually thought possible. It’s not magic, it’s just fact. You can be the most successful, filthy rich human being, but there is often something that will cause unhappiness or stop you from being an amazing person - for you and for those around you. Actor, writer, author, artist, director, producer - it’s all in you. I have witnessed it and seen it with all of my sessions, in big ways and in small ways. There are literally thousands of acting courses and schools you can choose from, and they are all valuable. No one class is better than another - you just gain something you didn’t know. Creating relationships is so important. By the end of August 2017 I will have just completed 11 international jobs that included working in Nashville, Kentucky, Australia and back in Melbourne and Sydney for more acting roles and coaching. Some of these were big budget jobs, but that’s not the point. All of this work came from relationships, training and letting go of being ‘right’ and thinking that I know it all (which I don’t) and continuing to learn every day. Getting to know ‘me’ still blows me away after 29 years in this career. What will you get out of this course on Magnetic Island? We start with relaxing yoga and meditation. Why? To simply leave behind all the baggage we carry around before we start the sessions. The sessions will be intense and long hours over the two days - in that alone you will create a different view of yourself. All of us at times make others our goal/role model and tell ourselves that we are not good enough. But we are, especially when we can find true value in what matters. Then we can find balance and have the career we want without the filters and the self sabotage. Will things go wrong? Yes. Will you and I fail? Yes. Always, every day of our lives, but it’s important to remember that no one will ever be perfect, or the best, because there is always someone who is better at some things. But we are all imperfect. We all want short cuts. Some are ok, others are not. We want greatness with out the RISKS and FAILURES that are necessary in life. This course is about that. What we identify with beyond just wanting to act, write, produce or direct is important. We aim to help you discover what you truly identify with, and in doing so get you 'on the court and changing your game'. We never know where we will go, but the key is never giving up. By knowing yourself better, taking action and balancing your life, you can do what you love. Money and being famous does not bring happiness. What can bring happiness is understanding that instead of a life full of mistakes, failure and not getting what we think we want, that discovering what we are good at can help us action to be better at what we want. Failure leads to learning what went wrong. With the next attempt we get to be ‘less wrong’ and so on. Do you think the famous painters, artists and inventors gave up because they failed? No they never gave up. They failed and learnt. This session will show you things that you are capable of. It may change direction, but it’s all an experience and about taking risks. See the things in you that have been hidden, and take the risk to discover more about you - the actor, director, writer, or artist. I look forward to taking you on your inspiring journey of self discovery. 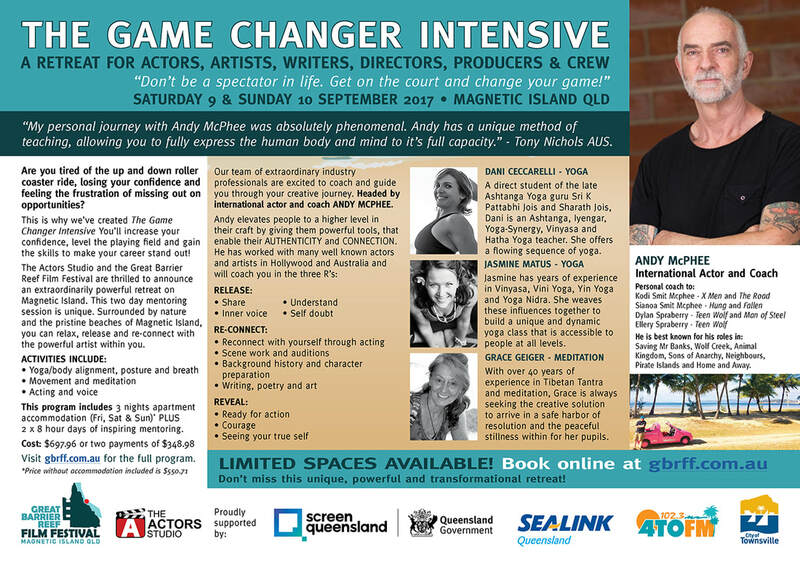 “My personal journey with my acting coach/mentor Andy McPhee was absolutely phenomenal. Andy has a unique method of teaching, allowing you to fully express the human body and mind to it's full capacity. He has given me a variety of techniques that helped me gain more focus, crush away any doubts, staying positive and confident, unleashing personal habits, producing outstanding results - and the list goes on and on! By developing all these skill sets I am now making things happen … networking with people, creating opportunities and achieving fantastic results not just in acting but also in life itself - like never before! Tony now has his own film in pre-production with interest from the AFI. He is also currently working on a film in Russia because he now thinks big and takes risks! “Andy McPhee has been an incredible resource for my family. In spite of my sons having Asperger’s disorder, Andy agreed to coach them both. Since beginning their teaching, their social and communication skills have increased, and their confidence has blossomed. Andy is kind and gentle, but he sets the bar high and does not let them be held back by their circumstances. My sons have risen to his expectations and have great respect for him. We could not ask for a better coach.” - Mrs Kenney, Colorado USA. “Andy, thanks so much. Again I can't thank you enough for triggering things off in me. Being an acting coach myself I also need to have a place to be creative and free and I loved that yours was four weeks because I travel so much for work and I love that it was a group of women. The just go for it problem solver. Just get up and do. Who knows how the rest will fall into place. I believe it has given me the fire to know I can do it, I'm very much a go getter however sometimes I stop when it comes to money, so I have decided to do what I need to and most can all be for free through free through online book, at home gym workouts to keep me motivated. And to just do it!! “I didn't know what to expect, but something inside me said it would be the first step in a good direction. I think this is about learning - instead of hearing. The sessions were motivational and inspirational. It was so much fun to work with art again. You get to see things about yourself that you didn't think about before or another way of thinking. I want to do so much more, I have seen myself doing things that I wasn't even expecting that I would ever do, like writing a play. I loved it! And now I want to get somewhere, I want to do more. Yes! I am gonna do this! 5 Do you think I'm the person that can get you to the next level: I think so, with all the experience, the network. And work together even with this beautiful group of women! I got so much out of this class. Joy, getting myself to another level. And really focused! What I enjoyed the most, was the homework, the motivation and writing a play. What I maybe missed a bit, was the acting part more, how you present yourself and how you become better in what you want. "Each group brings a new experience. The just 'do it' motto is only enhanced by repeat visits to your workshop. My second round has proven to make an even stronger impact on my ability to work with my daily choices rather than against them. Andy has the ability to trigger the truth without offence and then nurtures/guides the lessons that a person or group may be unfolding. Illusions are broken without the artist being broken. Andy allows the space to be open from the beginning with a feeling of security and safety. From this workshop I have learned to surround myself with a community that reflects my creative life choices. I have learned to modify according to each new step I take forward.